Hi guys, this'll be quick. So ultimately, what this is about, is anyone who has slipped through the cracks. I feel like I've contacted everyone, but I'd really like to be thorough. So if you (or anyone you know) has been looking for me (by this name, or my old screenname glanth) please contact me through this post or my repayment post linked above. I'm really happy that I think I have this almost entirely resolved. So, I have some new gets, more BW pokemon figures! speical thanks to herar for selling them to me, and now it's time for more Pokemon Photos! All descriptions, silly things, prices, sizes, are there on that site. But! Wanna just see the pics without all my attempted-witty banter??? You betcha!! Witness all 28 Items in the Stunfisk Pokedex Pokemon Center Promotion!!! and that my friends, is how electric pokemon history is made. "I want to buy those Maggyos..."
I will restock them when the Center does... I promise! They led me on to believe they'll restock, so cross fingers. I'll get cushions and mats too if I can! "I was going to buy Type Focus things from you, but the shipping was ridiculous." Yeah about that... heh heh the weight input was ridiculously off. Thanks to a member pointing it out to me, it's been fixed. Type-focus plushies, keychains and towels ahoy! "Hey, what happened to the 900 charms you bought us?" Oh those? Well they are ALL FRIGGIN PACKED THAT'S WHAT!!! If you paid, that is. Or weren't combining with something I'm waiting on still. EDIT: Going to go work out, be back in about 2 hours! Hey guys! Remember Truxtor's GB? And this Group Auction from eBay? Some of you did not buy from the group buy and owe shipping payments from the group auction and I'm assuming since no one asked they didn't see it in my last post with the sales of the extras. I'll put the extras and shipping quotes for those who deserve to have their kids shipped to them under a cut. Payments should be sent to Kassia9 at cityblackout@yahoo.com. Label it GA Payment 1, and include your username and what you won. Today i bring sad news. After i got off work today i checked my mail, like i do everyday hopeing sometimes i ordered arrived. I called their customer service line and the lady told me to take the package to the closest USPS location and to contact the seller. But she doesn't think that we will get back the items. thank you everyone for your help! at this point i'm just waiting on the seller to respond and hopefully together we can get things solved! you've all been very helpful and i feel much more optimistic that things could turn around! (or we could get the money back) OR SOMETHING! This is a shout out to haemseuteo. It has been three weeks now since I paid for my $400 order of card and I have yet to receive a package. I am getting a little worried and I see that other members who bought from you around the same time have gotten theirs. :/ I have tried contacting you via PM and through the post itself to see if there has been a delay in shipping or if by chance my package was lost in the mail. I know LJ messaging via email notices have been off and aren't reliable so I wanted to make a post here on the community to see if you see it or if anyone who might know another contact I can try. With such a large order, I really am concerned! If worse comes to worse and I don't hear from you, I'll have to contact my credit card company and cancel the payment which is something I really don't want to do since I can't open a dispute. So PLEASE, if you see this or if anyone knows a better way to contact haemseuteo, please let me know ASAP! i know i have promise to make the spreadsheet this week but becuase i have lot of school work to do this week so please give me more days to do the spreadsheet. I promise i will done by finish it this weekend. Im sorry to make you be patient. I have the limit of $8, sent to the US, 13601. I'd like the box and card with it, but if that's not possible, that's okay. Hello everyone. :3 This is just a small update on some new thingies I've gotten recently, both Raichu and Emolga related. Whatever could they be? 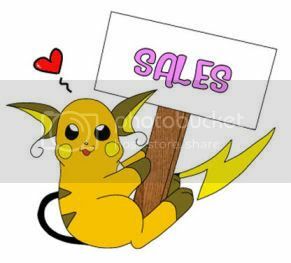 Finally, I've updated my sales post removing things that have sold, etc. I REALLY need this stuff gone and I'll probably put whatever is left in my shop by next week up on Ebay. Feel free to make offers on ANYTHING! ...so expect a HUGE update from me here soon. :3 I'll probably post the things I get at the kiosk on my bday too. 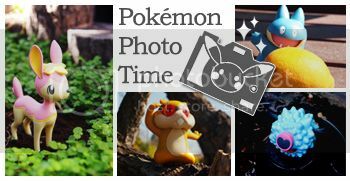 This weekend my fiance and i finished raking through some boxes (we moved into our new house 3 months ago and still haven't fully finished unpacking x() and came across more of my pokemon items :D a lot of these items couldn't find a shelf, so for the same reason as last time, they are being put on my sales post for a chance to find a loving home with you lovely people.